We’ve had some really exciting developments with the media this week. After getting some advice from the Media Relations team at Carleton, we managed to get in contact with a couple different TV programs. This led to some chatting with The Discovery Channel and they decided they’d like to get some footage of us doing various moonbuggy tasks! Because they’re based out of <?xml:namespace prefix = st1 ns = "urn:schemas-microsoft-com:office:smarttags" />Toronto, they asked us to film our team members building parts in the machine shop and assembling the buggy. We happily agreed and spent Friday morning filming each other finishing up parts in the machine shop. 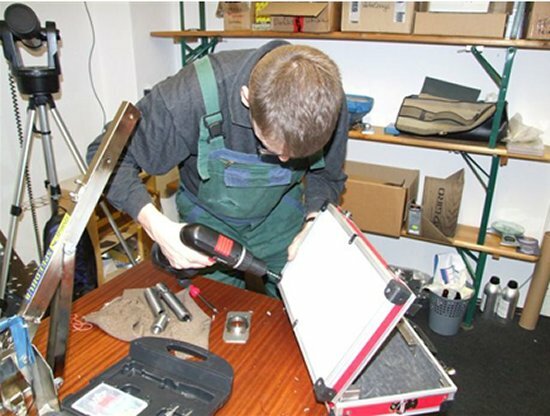 When we finally completed our work in the shop, we started building the buggy, and eight hours later, it was assembled! It still isn’t 100 percent complete — it’s missing pedals and seats, and various other things need to be adjusted, but it was complete enough for a photo shoot with the university publication Carleton Now. Upcoming highlights include making the seats and our rider tryouts. 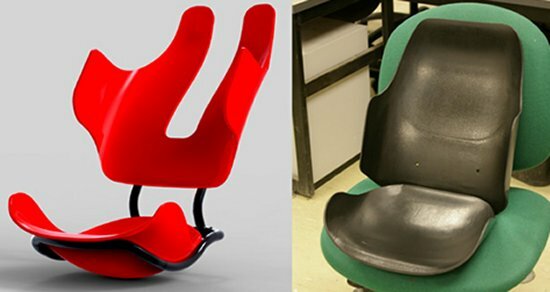 Andrew Lowe, our Industrial Design team member, will be building the seat mold and vacuum-forming the seats followed by some CNC’ing in the machine shop. Tryouts will consist of a short individual time trial on a stationary bike in our Athletics Center. Hopefully we’ll be riding our buggy by the end of next week! 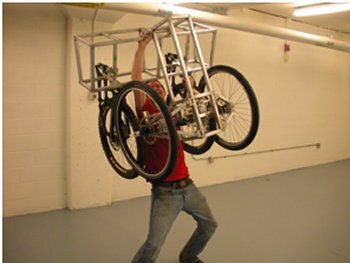 How did you get involved with the Moonbuggy Project? I started with the project when it first began here at Carleton. I was young and naïve and was drawn to the glamour of NASA and a trip to Huntsville. I’m glad I got involved — the entire project was one of the coolest things I had done! What do you do as tech manager? This year we’re trying to move the project in a direction more critical of engineering principles. As tech manager, I’m responsible to take the work from each design team and make sure they did their math properly. I’m also Curtis’s right-hand man when it comes to the administrative and financial work. 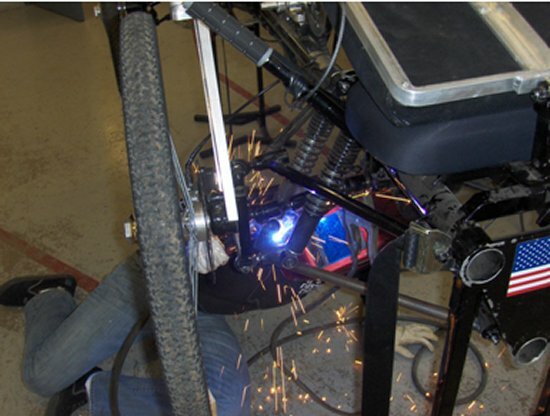 What’s your favorite part of being on the moonbuggy team? It’s hard to pick just one part that I enjoy the most. If the project wasn’t as much fun as it is, I probably wouldn’t be doing it. But if I really had to pick, it would be seeing the buggy go together. It’s especially rewarding to see paper designs become a reality. I was having a conversation with Brian, our tech manager, about how I wished that [our engineering curriculum] had more actual design projects for students. He told me about the moonbuggy team and said he had an opening for someone to design the suspension. I told him I was interested and it just went from there. What have you liked best about the project? I’ve really enjoyed the build so far. I’ve always liked hands-on projects, and actually seeing our design taking shape has been really exciting. Is there anything in particular that you are looking forward to? It’s going to be really cool to see it finally completed. When the buggy is finished, and we ride it around for the first time, it will be really exciting. We’ve all put a lot of hard work into the project so far, and I’m really interested to see how the final product will turn out. Also… winning. Carleton’s moonbuggy team this week held its Comedy Night fundraiser — get in touch with them to talk about how your school can come up with similar ways to raise money for your Huntsville trip! <?xml:namespace prefix = v ns = "urn:schemas-microsoft-com:vml" /><?xml:namespace prefix = o ns = "urn:schemas-microsoft-com:office:office" /> Ralf Heckel’s back with a spotlight on the German Space Education Institute and its 2009 moonbuggy team. The German Space Education Institute (SEI) in <?xml:namespace prefix = st1 ns = "urn:schemas-microsoft-com:office:smarttags" />Leipzig is a grassroots association of public utility and support for the engineering professions in the astronautics sector. More than 60 prominent international specialists work for this unique initiative. They offer international students excursions and internships in the aerospace industry via Germany to the United States and Russia. There is a variety of possibilities among the association’s programs, including full-time activities for 8th grade students, international competitions, advancement for A-level students, exchange programs and various special tasks for talented school students. 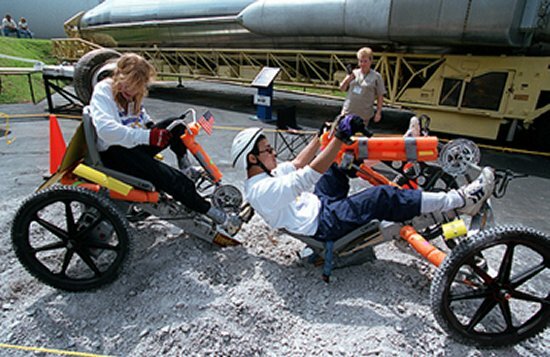 Participants who graduate excellently in Leipzig (in workshops and excursions on weekends or on holidays) are delegated to the Cosmos Olympiad in Moscow or to NASA’s Great Moonbuggy Race in Huntsville, Ala. Because of the Institute’s relationship to industry and business, graduating from the German Space Education Institute opens doors: helping students get jobs, or get accepted for further studies. The German Space Education Institute is thankful for every interested engineer and industrial partner who has helped to build science bridges for exploration around the globe. Its international education partners in Russia are the Institute for Biomedical Problems (IMBP) in Moscow, the Youth Space Center Moscow, the Baumann Technical University Moscow and the Professorship for Life Support Systems in Space. Ralf and Yvonne Heckel have been advisors at the Space Education Institute in Germany since 2001. Yvonne is representative of the Space Camp® ambassador program and the Russian space agency ROSCOSMOS. 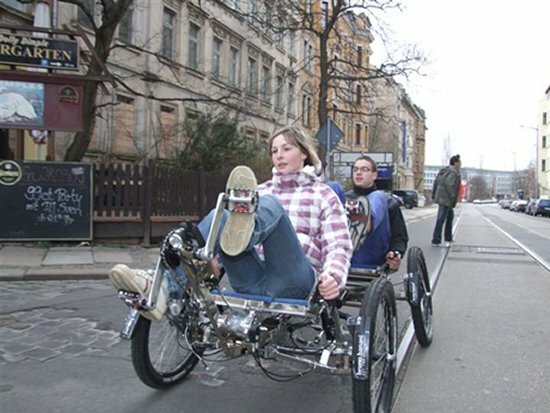 She is the financial part of the German Moonbuggy team. 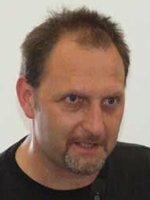 Ralf is the technician and is teaching and selecting the German students to take part in high-level space challenges, university and jobs. He has space contacts around the globe — and into orbit. 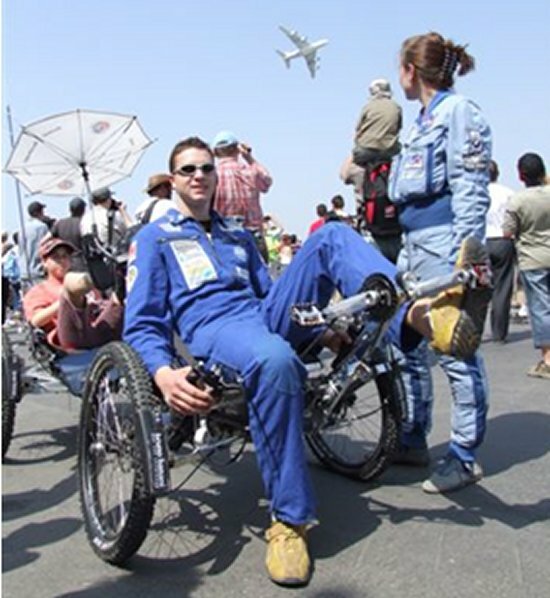 He writes books and is the organizer of the German Moonbuggy team. Lisa Hartenstein of Chemnitz, Germany, started at SEI this year. She is the female moonbuggy pilot and specialist for marketing, sponsorship and security. 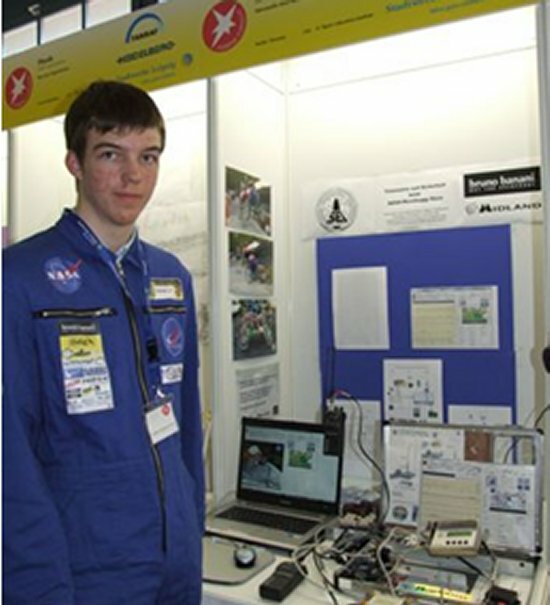 Thommy Knabe of Plauen, Germany, has been an SEI student and part of the moonbuggy team since 2006. 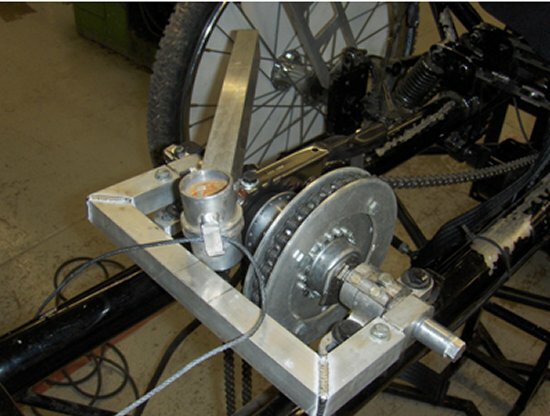 He is the kinematic specialist for the German moonbuggy, and constructed the first moonbuggy simulator. See Thommy’s work here. 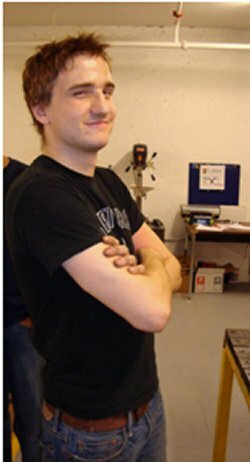 Fabian Hoffmann of Leipzig, Germany, has been an SEI student since 2005. He is the CAD designer for the moonbuggy body. Christian Hein of Stendal, Germany, joined SEI in 2008. Working with younger students, Christian designed the differential gear and carbon pieces. See Christian’s work here. Christian Schmidt of Dusseldorf, Germany, joined SEI this year. 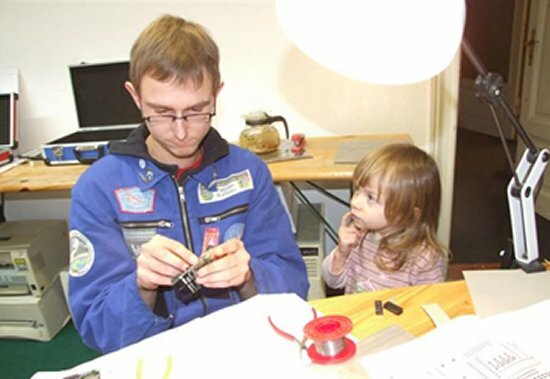 He is the electronics and software specialist for moonbuggy telemetry. A sample of his work can be seen here. Cosma Heckel like to fly with her parents around the world. She made 32 airplane flights in two years, saw two rocket launches and was present for the Great Moonbuggy Race in 2007 and 2008. 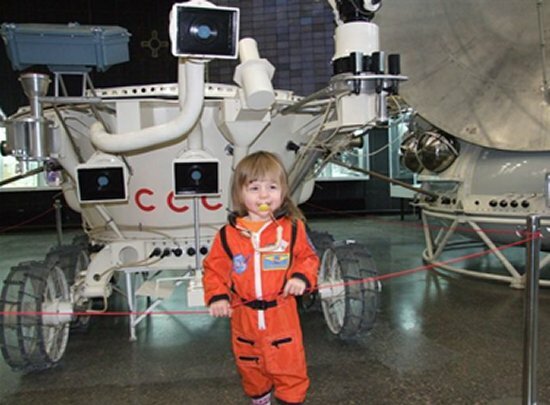 Here, she’s visiting the Soviet robotic lunar rover Lunokhod in Kaluga, the Russian hometown of Konstantin Tsiolkovski. German designer Bruno Banani is our main sponsor. 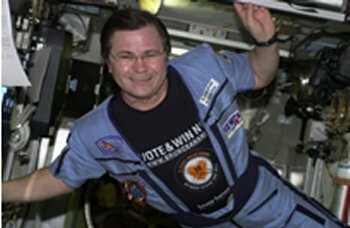 He is Germany‘s only non-government main sponsor for space education. We are also thankful to all our other sponsors and partners. Bringing Something New to the Contest? Got an innovative idea for a three-wheeled moonbuggy? Placing your riders side-by-side, or back-to-back? How about a custom paint job? Whitewall tires? Cupholder? What unique spin will your team put on its moonbuggy design to win the “Best Design” award come race day? Innovation is still out there, of course — just ask German team advisor Ralf Heckel about composite materials, electronics and onboard software! 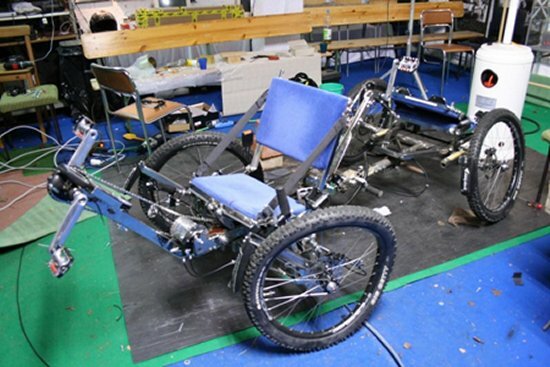 But in terms of basic structural design, latter-day moonbuggy entries tend to look a lot alike. 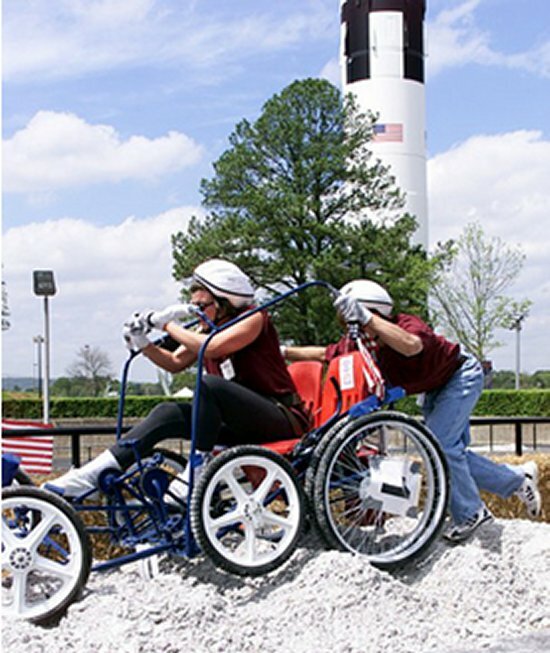 Huntsville, Ala., also ran into problems in the 2000 Great Moonbuggy Race. “You do still see some three-wheeled buggies now and then,” Selby says, “but that’s a lot of stress and punishment to put on just one wheel, whether it’s in the front or the back. Those vehicles often just don’t hold up over what turns out to be a pretty punishing course. 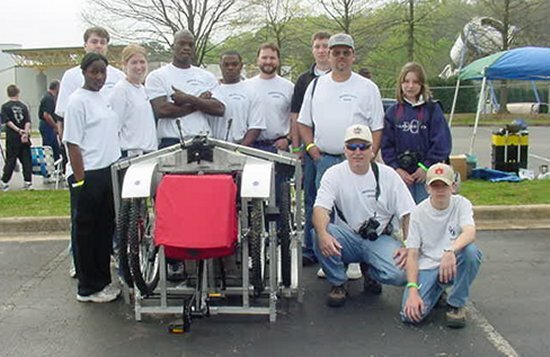 Scotlandville’s team really struggled last year when it came time to assemble the moonbuggy for the race. Due to the fact that the buggy was not able to fit within the 4-foot-by-4-foot-by-4-foot box, we were forced to remove items from the moonbuggy, such as steering and the wheels — therefore adding to our assembly time. 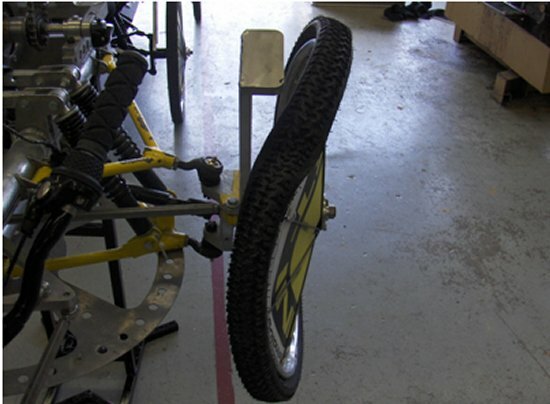 This year we have designed the frame of the moonbuggy so that we will not have to disassemble it to fit inside the box. Overall the team is gradually making progress. We are using the lessons we learned from our mistakes last year to better the design and performance of our moon buggy. Bringing something new to the competition this year? Let us know — show off photos of your cutting-edge moonbuggy here in the blog and elsewhere on GMBR’s Web presence! E-mail your images to richard.l.smith@nasa.gov. Author astoreyPosted on March 16, 2009 March 19, 2013 Tags General4 Comments on Bringing Something New to the Contest? Where&apos;s a Team to Weld? With a presentation and various media photo shoots scheduled, everyone has been putting in all available time this week (including class time) at the machine shop, getting parts ready to be welded. When we showed up Wednesday morning, however, ready for a day of welding, we found that the MIG welder had been taken over by the 4th-year students’ Formula SAE Car project — and the TIG welder had been broken all week! Things started to get a little stressful as we frantically thought of our limited options. 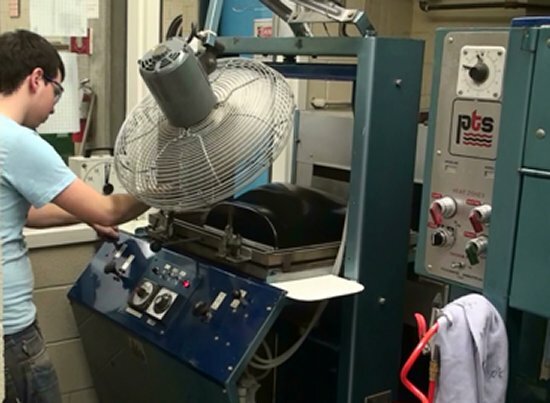 1) Pay to use the university’s maintenance machine shop… not sure if they would do that for us though… 2) Use the Industrial Design program’s machine shop. We do have a few ID students on the Carleton moonbuggy team, but that shop is specifically for ID school projects, so… 3) Well, there really wasn’t a third option! While Curtis was frantically trying to figure out some way for us to weld, I was dealing with e-mails and phone calls from university and city publications and media, all of whom wanted photo shoots and interviews during the presentation. Scheduling photo shoots during my morning tutorial — while receiving text messages saying the buggy wasn’t going to be ready in time — was stressful, to say the least! Finally, we managed to get some time with the welder in the ID shop, and while Brian, Curtis and Chris finished the welding, I finished my Materials test in my tutorial so I could join them to help assemble the frame. After a frantic morning, everything worked out in the end. The photographers from the Ottawa Citizen and Carleton Now showed up, and after seeing our semi-assembled buggy, agreed to come back next week, when we could do a “cool” photo shoot with us actually riding the buggy. Luckily, the TV station that was going to come as well didn’t show, so hopefully we’ll be able to contact them for an interview next week. We hope by then Lindsay and Co. will be ready for their close-up! Happy assembly period, teams! Due to the midterms this past week — and the fact that Carleton was on holiday the previous week — there hasn’t been a whole lot of progress on the actual building of the buggy. However, there have been a few exciting events to fill you in on. The first was that our final shipment of aluminum arrived and was only missing one (very important) piece! Now we can finish off the frame in time for our exhibit next Thursday as a part of National Engineering Month. The second exciting thing was a direct result of the last blog we posted. The day after the blog went up, we got an e-mail from the folks in Carleton Media Relations, who had noticed the blog and were offering to help us with publicity. This was an awesome and much appreciated surprise! Actually, there have been a few other awesome surprises from Carleton that need to be mentioned. Our applications to the various student groups for financial aid finally went through and we got some funding! Though we have been getting more financial help from the university, we still need considerable funds for the actual trip down to the competition. Coming from Canada, this is a fair amount of travel and all travel options seem to be fairly pricey. Last year we drove, which turned out to be a great road trip — 20 hours down, 25 hours back, great for team bonding! This year we thought about switching it up — maybe flying or… renting an RV! This was a really exciting idea — it would be so much fun and we could even save money on hotel rooms. Then we found out you have to be over 25 to rent and drive an RV. So now we’re back to the original ideas: flying or driving. And definitely renting hotel rooms. Which is where our fundraiser comes in — “Carleton Moonbuggy Comedy Night,” to be exact. It just so happens that Absolute Comedy, an awesome comedy club just down the street from Carleton, gives various charities and non-profit groups the opportunity for fundraising! They provide the comics — a mix of pros and amateurs — tickets and the venue, and all we have to do is sell them. We’re hoping for a big turnout. To help promote the event, we’ve created a Facebook event. Facebook users can search for “Carleton Moonbuggy Comedy Night” on the site to learn more or RSVP, and if you happen to be in Ottawa on March 18, come on by the comedy club and help put the FUN in FUNdraising! The Buggy Blog looks forward to finding out how the comedy fundraiser goes; that’s an innovative idea for raising awareness and money for Carleton’s moonbuggy team! What’s your school doing to raise funds? Let us know via e-mail. 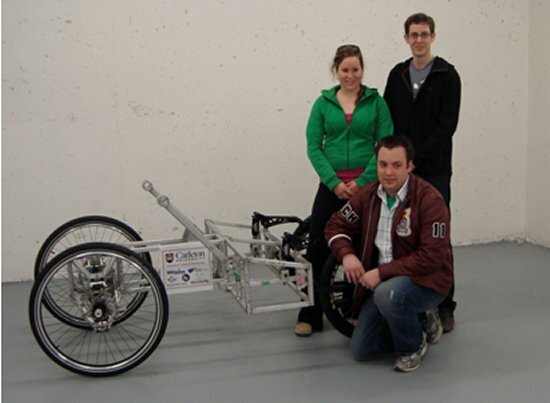 For more about the Carleton moonbuggy team, visit http://cuseds.engsoc.org. 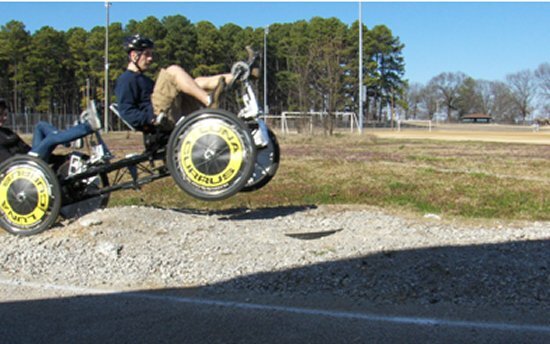 Savvy racers know their competition, and few names fire up moonbuggy teams like the Huntsville Center for Technology. One of two HCT teams took first place in the high school division in 2006, the school took first AND second place in 2007, and last year they continued to eat up the top slots, coming in second and third behind new champs from Erie High School in Erie, Kan. The Huntsville Center for Technology is back for another year! We’ve enjoyed being international Great Moonbuggy Race champions and would like to do it again. This year we will be entering two moonbuggies. Students have been training harder now that we have our new in-house moonbuggy track at the school. 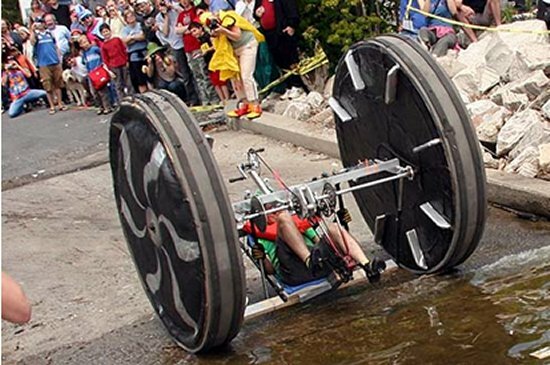 We would like to Skype with a school that has a moonbuggy team or perhaps is thinking about entering. If you are interested, e-mail us. pedaled into second place at the 15th annual Great Moonbuggy Race, held April 4-5, 2008. The school is gunning to retake the championship in 2009. Can your team keep that from happening?